For Jana Kovich, a 3L at Duke University School of Law, successfully tackling public policy issues is a matter of scale. Studying public affairs and public policy analysis as an undergraduate at the University of Indiana-Bloomington, she said that she often found the issues at hand too large to fully comprehend or decisively resolve. 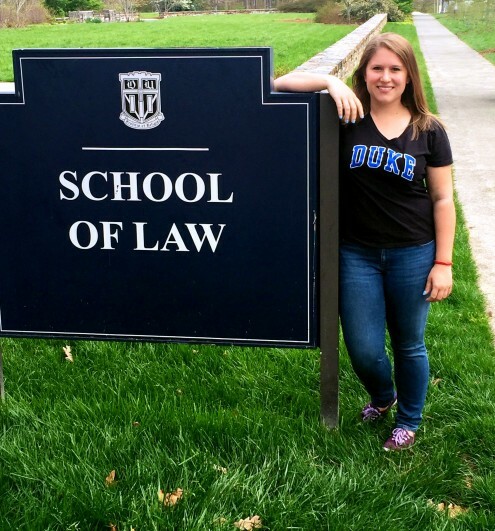 While learning to think and parse issues like a lawyer lured her to law school, leading the Duke Bar Association -– the student government -– engaged her energies and anchored her to the law school community starting in the critical 1L year. Now, as a three-year veteran and, this year, president of the Duke Bar, she said that she’s had the opportunity to interact with the administration, faculty, staff and, most important, the entire graduate student body at Duke. LAWDRAGON CAMPUS: What were key factors in your choice of a law school? JANA KOVICH: Keeping my GPA and LSAT score in mind, I started much as others do, listing schools that would be more of a reach and others that would be less so. Applying to law school can get pretty expensive, so I was more likely at this stage to apply to schools providing an application fee waiver. I applied to a variety of schools all over the country, including at my alma mater, Indiana University, which offered the added benefit of comparatively low tuition for residents. At the time, I wasn’t sure where I wanted to end up practicing, though I knew that I wanted to work in transactional law. Because of that uncertainty, going to a school like Duke, which has excellent nationwide and global job placement, was a better bet for me. While choosing between staying at Indiana or leaving for Duke was a tough decision, with the benefit of hindsight, I know it was the right choice. At Duke, I’ve been challenged in many ways: Among them, this born-and-bred Hoosier learned to adapt to a very different new home in North Carolina. After 1L, coming to Duke also made me realize how much I love the Midwest. It’s an old and familiar story -– sometimes you have to leave a place to fully appreciate it. Now I’m excited at the prospect of living and working in Chicago. Additionally, no other top law school had Duke’s combined J.D.-LL.M. program in international and comparative law, which enabled me to achieve both degrees within three years. This degree program allowed me to have international and curricular experiences unmatched anywhere else. Because of the joint program, for example, I started law school a month after graduating, taking two courses, meeting my core classmates and acclimating to Durham, N.C. It was a great introduction to law school and to Duke. I also loved that during my first years, I was able to take upper-level classes and that everyone in the LL.M. program works and studies throughout the summer. Duke helped find me a job in Germany with an American law firm, K&L Gates (that I speak German was a bonus) helping the M&A group with companies incorporating in the U.S. and translating for the arbitration group. I spent the rest of that summer in Hong Kong taking courses in transactional and business law with some Duke classmates and a lot of international students. What really sealed the deal regarding me attending Duke Law was the amazing sense of community I experienced when I visited in March 2012 for Admitted Students Weekend. The students were incredibly friendly and welcoming, describing their experiences at Duke Law and all the reasons it had been the right decision for them. The faculty was similarly enthusiastic about the law school and about the prospective Class of 2015. I immediately wanted to be part of the community, and haven’t looked back since. LD: What has been your most memorable law school experience? JK: My most memorable moments from law school can be summarized in two words: National Champions. In April of this year, Duke men’s basketball brought home a fifth banner to Cameron Indoor Stadium. The “drive for five” was the most fun I have ever had watching March Madness. But the championship game in Indianapolis, against Wisconsin, was hands down one of the most amazing nights of my time at Duke. Cameron Indoor, our intimate and legendary basketball stadium -– it holds a mere 9,000 people -– was packed with students: No one else was invited or permitted to join. We watched the game on the giant TV screen, sharing in each other’s anxiety and euphoria as the Devils went from up 5 to down almost 10, only to win it all in the last five minutes. The buzzer in Indianapolis signaling the Blue Devils had won was like an explosion of excitement and pride in Cameron. The other national championship happened in April 2014 in Charlottesville, Va. If you weren’t convinced that intermural softball is the sport of choice for future lawyers, you need look no further than the University of Virginia Law Softball Invitational — a nationwide law school softball tournament that brings more than 90 law school teams to Charlottesville each spring. I made the trip north to Charlottesville with my team of fellow 2Ls expecting to have a fun weekend playing right field and participating in a great Duke Law tradition. What I did not expect was to walk away triumphant. LD: What has been your most valuable law school experience? JK: Hands down that’s been my work with the Start-Up Ventures Clinic as a 3L. I firmly believe that clinical education is foundational for any lawyer-in-training. In this particular clinic, I guided two local start-ups with diverse issues such as intellectual property ownership, entity formation, contract review and equity issuance. This semester, I am working to create helpful tools for women wanting to be entrepreneurs (sites.duke.edu/aheadofthecurve) and an instructional board game for start-up founders. This experiential learning component of my education at Duke gave me ownership over real-world outcomes and allowed me to find my passion within the law. Participating in the clinic also influenced my decision to apply for a Public Interest Law Initiative Fellowship for Summer 2015. As a Fellow, I’ll work in the Chicago pro bono community for 300 hours both while prepping for the bar exam and immediately after taking it. I’ve been placed with the Chicago Center for Conflict Resolution, where I’ll be trained as a mediator and assist in the resolution of various disputes as I get to know the Chicago legal community. My other valuable law school experience was serving as the president of the Duke Bar Association from 2014 to 2015. While I held numerous leadership roles as an undergraduate, I truly believe that I did not understand what “leadership” was until I became president of the Duke Bar Association. At the same time, I’m overwhelmed by the support I’ve received in this role from the Duke Law administration, student leaders and from my peers. Without them, I would not have been able to spearhead the effort to bring back Family Weekend, assist in distributing more than $250,000 over three years to various student initiatives and events, or join university President Richard H. Brodhead in dining with the leaders of each graduate school. LD: What do you plan to do with your law degree after graduation? JK: At the end of my fellowship at the Chicago Center for Conflict Resolution, in Fall 2015, I’m on track to start as a first-year associate at Latham & Watkins in Chicago. Although I’ve focused on international law I’ve still tried to stay flexible and open-minded in terms of my area of interests in law school. What I love about Latham is that I was able to join its two-year “unassigned” program, which will enable me to experience and choose among its various corporate sectors.